Cody Roney, the incoming executive director for Lula Lake Land Trust, poses for a photo Friday, February 8, 2019 at Lula Lake in Lookout Mountain, Georgia. Roney was formerly the executive director for the Southeastern Climbers Coalition. On a crisp afternoon, Cody Roney leans against the wrought iron rail above Lula Falls and smiles serenely into the sun. She appears right at home — and she is. Last month, Roney was named Lula Lake Land Trust's new executive director. 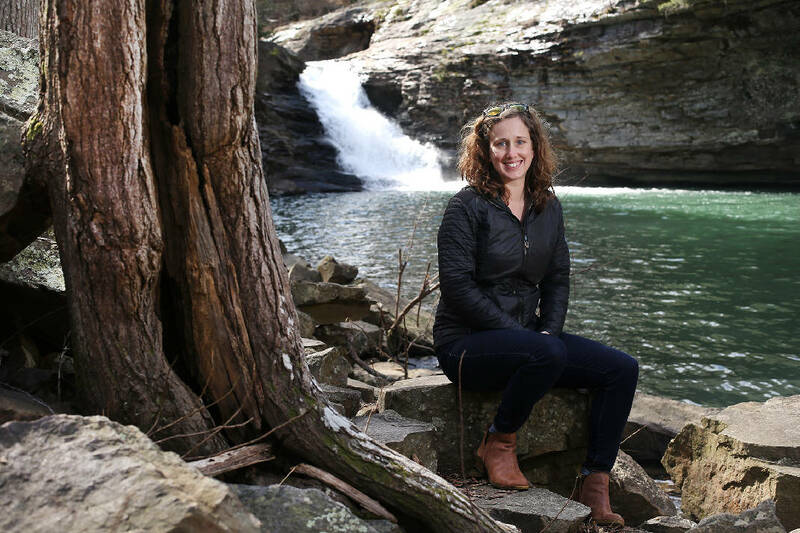 While Roney says she is still getting the lay of the land — all 8,000-plus acres of it — she is no stranger to Chattanooga's outdoor and conservation community, or even the pages of Get Out Chattanooga. In January 2016, we featured Roney in one of our first "Wild People" spotlights after she was named executive director of the Southeastern Climbers Coalition, a nonprofit dedicated to preserving climbing access in the Southeast — making her the first and only person to be featured in "Wild People" twice. Indeed, Roney's resume is as impressive as her commitment to local conservation. Recently, she took a few moments to speak with us (again) about her latest role in protecting the region's most precious resources. >> I loved my time with [Southeastern Climbers Coalition] and will continue to support and volunteer with that organization, but I was ready for a new challenge. After seven years, I was beginning to feel that it was time for a change. I had pretty particular requirements: I wanted to stay in Chattanooga and I wanted to continue working in conservation. Lula Lake Land Trust is a nonprofit organization currently protecting more than 8,000 acres within Lookout Mountain’s Rock Creek watershed. Its core property, which features the iconic Lula Falls, is open to the general public on the first and last weekends of each month. In order to prevent the property from being over-loved, guests are required to register before they visit and pay a small fee. Learn more at lulalake.org. >> I have worked with [Lula Lake Land Trust] over the years and truly respect the organization as a leader in the local conservation world. When I found out about the position, it seemed almost too good to be true. I'm glad I didn't let that stop me from applying! >> [My first day on the job] was awesome! I haven't had an office to go to in over seven years. Most people think I'm crazy for being burned out on working from home. It was great to get to make that beautiful drive up Lookout Mountain to the office. I thought I would be more nervous, but really, it just felt like walking into a job I'd been doing for a long time. I spent most of my first day getting to know the staff and learning the intricacies of the office. >> I want to spend some time learning about our (the trust's) history and understanding the goals of the staff and board before I develop short- and long-term goals. I know I want to grow our education and research programs, as well as continue to preserve properties around LLLT. >> Our main goal as a land trust is conservation, but we have a lot of unique programs that I want to learn more about. >> I think one current challenge — although, I wouldn't really call it a challenge — is just getting to know a new community [of people]. I was so immersed in the climbing/outdoor recreation community before, and now have an entirely new community to build a relationship with. I look forward to meeting the LLLT supporters and users, but I know building those relationships will be a process. >> As a lover of outdoor recreation, [Lula Lake] is special because there are endless miles of trail to mountain bike, hike and run all throughout our property. When people think of [Lula Lake], some think only of the core preserve that is only opened twice a month. But there are trail systems that connect [Lula Lake] to Cloudland Canyon and Five Points that people are welcome to enjoy any time. >> Not being originally from the area, I don't have stories of coming to Lula Lake as a child, but I think my first visit had a similar effect on me that it does many people. [Lula Lake] is such a stunning property. The hike to the waterfall is not only beautiful, it tells a unique story. You get to see the chestnut restoration project site, thriving hemlocks and possibly even some wildlife. The best way I can describe this experience is magical. >> As someone inherently passionate about conservation, Lula Lake is incredibly special to me because it preserves a beautiful piece of local history for future generations.